What's that word which starts with M and is something that you always want more of? 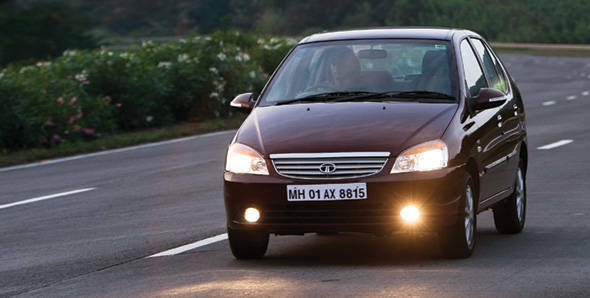 If you have answered 'mileage' then the Tata Indigo eCS in India is calling out to you. Loudly. The company claims it's India's most fuel efficient sedan with an ARAI claimed mileage of 25kmpl. That's a claim we had to put to test. So we decided to take the top end version - the Indigo eCS VX - from Mumbai to Pune. We travelled a distance of 136.7 kilometres from Belapur where we tanked up the car to the brim, to a petrol pump close to our office. We drove religiously in 'control mode' which meant gear shifts below 2000rpm and top speed limited to 80-90kmph. So what magical mileage figure did we achieve? We will come to that in a bit. A few key factors have helped the eCS achieve the 25kmpl mark. It begins with the engine where the head has been redesigned to allow better combustion. Then the engine management system has been programmed to optimise valve timing and other parameters to increase fuel efficiency. Improved gear ratios, 14-inch low rolling resistance tyres and a reduction in weight by ten kilos all contribute to increasing the fuel efficiency. The Tata Indigo eCS in India's 1.4-litre CR4 diesel engine produces 70PS of power at 4000rpm with a peak torque of 140Nm available from 1800 to 3000rpm. Though the diesel mill is loud there is sufficient insulation to muffle it on the inside. At idling the steering wheel and the gear lever tend to shudder a bit. But the car is easy to drive in the city because of its good low end torque. On the highway it cruises along comfortably if you keep the tachometer below 2000rpm but above that it protests. Overtaking in the fifth gear though is an issue and you have to downshift. On the appearance front, from the outside there are no changes except for the badging. Inside, the eCS VX gets new dual-tone beige seating, a wood-finish centre console and dials with chrome surrounds. Rear passengers get a centre armrest. The top two variants have ABS, Bluetooth connectivity and electrically controlled rear view mirrors. Now back to the mileage test. At the petrol pump in Pune 4.46 litres of fuel went in. Which means we achieved an incredible mileage of 30.65kmpl. The Tata Indigo eCS price in India starts from Rs 5.34 lakh for the LS going up to Rs 5.87 lakh for the VX, those looking to enter the sedan class, don't want to spend too much and want excellent mileage, this is an option worth considering.